Firstly, it calls on the Council’s management to come up with proposals to address the continuing housing crisis and homelessness – the local authority has a duty to represent the community, it cannot set this duty aside by pretending that the issue is for Government policy decision alone. Secondly, it calls on the Taoiseach, as head of Government, to declare a National Emergency in order to address the housing issue with the urgency it deserves. Are people not more important than sheep? Here is the response of the Housing Department to the Notice of Motion submitted… what they describe is obviously not enough, the housing problem gets worse by the week! We need a National Emergency Committee established without delay, bringing all the needed resources and interests together, and they need to be told – solve the problem! Current state policy, promoted by successive Government, serves private interests in the Banking and Property sector. The so-called right to private property and the needs of a ‘free’ market (which is anything but free) are given every incentive – all at the expense of young couples and families trying to setup home or live a ordinary life – without rack rents, punitive mortgages or simply left with no place to call home. Local Councils must take responsibility, through action on the issue of homelessness, it is hoped that adopting this motion in Cork County Council will be the start of change. I am calling on colleagues in Cork City Council to do the same, in fact I will be writing to every member of a local authority in Ireland encouraging them to adopt a similar stand. 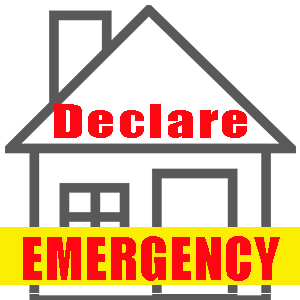 Yes, more than declaring a National Emergency is needed – we need to takeover the empty houses, we need a massive construction programme for social housing – we need to prosecute rogue landlords – we need to solidify tenant’s rights. Finally, action is what matters, not resolutions or talk. Sadly local authorities are noted for not translating their votes into action, a lot of hot air gets spoken in Council rooms, and in Dáil Éireann. It is time for public representatives to do their job – represent the people – the people are demanding action. I will be supporting the 24 hour #OCCUPY picket outside Cork City Hall on February 27th, it is calling for the declaration of a National Emergency – I invite Council members to join in. To request the Chief Executive to identify and report to Council on possible emergency measures to address the crisis – in social housing, in private rental, in standards of accommodation, on the conditions in homeless shelters and for the urgent elimination of homelessness. That An Taoiseach be asked to establish a National Emergency Committee on the issue of Housing and Homelessness that will act with an urgency at least equal to that which addressed the outbreak of Foot & Mouth Disease. Next Next post: Possible Sale of Public Land at Ballynoe, Cobh?